Towards the end of my first year of university, and after participating in various volunteering projects both inside and outside of the university, I made the decision that I would like to volunteer abroad. At first I was not sure about where I wanted to go or what I wanted to do; but after researching several projects and speaking to relatives, I decided that I would like to follow in the footsteps of a family member and volunteer in Moldova. When researching the real gap company (recommended by a family member and subsequently the company that I travelled with) I found a wealth of different projects to choose from. However, as I am training to be a primary school teacher with a focus on Special Educational Needs and Disability, I concluded that volunteering in a children’s orphanage was just the sort of project I was looking for. The project involved travelling to Moldova via Frankfurt and Vienna to work in an orphanage for children aged from birth – 7 years. Each day (Monday – Friday) I would travel with other volunteers from the volunteer flat in downtown Chisinau (the capital of Moldova) to an orphanage in central Chisinau, to work with a child on a one-to-one basis. Each day I was required to work from 10am until 12 noon and from 4pm until 6pm, however some days I stayed longer or arrived at the orphanage earlier. In each two hour time slot each volunteer would be given one child to look after. During this time I would often ‘pair up’ with other volunteers so that there were other children for the child I was looking after to play with. There was however, a stark difference of culture in Moldova compared to in Britain. Most remarkably I noticed, on my bus journeys to and from the orphanage, that no matter how full the ‘troleibuz’ (trolley bus) became (and it was frequently fuller than the London Underground at peak times) other travellers would enthusiastically jump out of their seats ready to give them up for older / disabled / pregnant others. However, that seems one of the only positive differences that I can find with the culture as unfortunately Moldova is only a newly established country and many sights are shocking. For example: many of the children who attend the orphanage are not orphans – they actually have parents – but their parents cannot afford to care for them as there is a great deal of poverty in Moldova. Furthermore, the living conditions throughout Moldova vary greatly, there are a few more modern buildings, but the majority of people live in badly maintained flats, made from crumbling concrete that is plastered with graffiti. On every street corner, market sellers set up their stalls to sell home-grown fruit and vegetables at a pittance of what their produce is worth: I purchased a large carrot, ¼ of a pound of potatoes, a large onion and a bell pepper for 7 lei which is the equivalent of about 25p. It really was shocking to see how people struggled, but how polite and happy they still were when trying to talk to you in English. Moreover, the conditions were worse still at the orphanage. 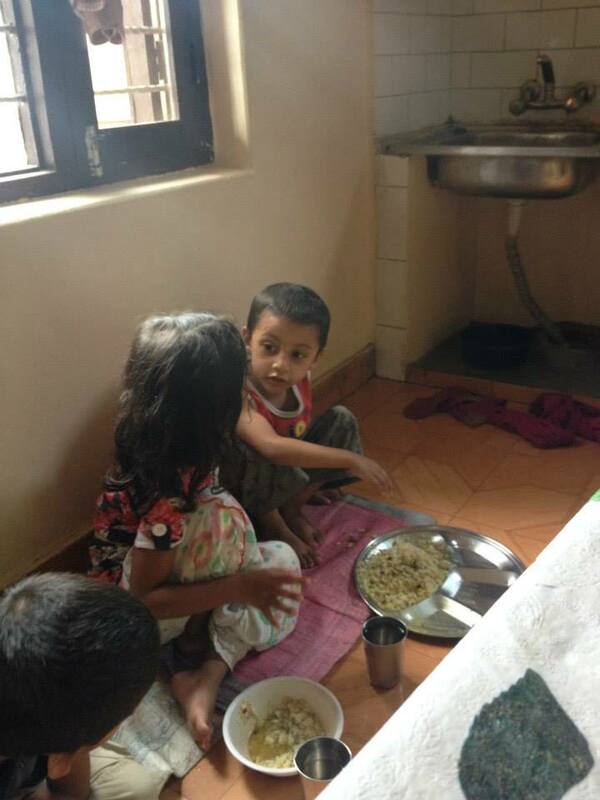 The children were designated just two nappies each per day, and had few clothes. All donations were shared, and the children had nothing of their own – it was a regular occurrence to see a child in a set of clothes that another child had been wearing just a day or so before. The orphanage workers themselves however were lovely. They were warm and welcoming despite not being able to speak a word of English. They seemed pleased that I had learnt a small amount of Romanian, and seemed to care deeply for the children. Throughout my time at the orphanage I thoroughly enjoyed working with gruppe 11 (group 11). The group of children I was placed with all had disabilities ranging from cerebral palsy to downs syndrome. The children ranged in their abilities to communicate; whilst some were fluent in Romanian and could also speak basic English, (most likely learnt from previous volunteers) others communicated through their actions and facial expressions. Working with the children was very fulfilling – it was great fun teaching one little boy to sing the song “Old mac Donald had a farm”, and even more rewarding when he came to me the next day singing it and wanting to learn other English words and songs. Whilst I was in Moldova I was also given the opportunity to visit a second orphanage called “Orhei orphanage”. It is situated about an hours’ drive from our volunteer flat and is home to boys and men aged from 7 +. As the state does not provide for adults or young people who have disabilities, many with disabilities such as muscular dystrophy live out their lives in places such as Orhei orphanage. Though I only spent several hours within Orhei orphanage, my experience there was great. I was deeply touched by the living conditions there (to conserve electricity no lights are put on inside the orphanage during the day), the building consists of lots of long, narrow corridors with few windows, so the building is in near darkness. The boys at Orhei however were very pleased to see us. It is customary for visitors to bring gifts for the orphanage and another volunteer and I took 6 kg of fresh peaches, 1kg of chocolate bombon sweets, 2 packets of balloons and 12 cartons of bubbles as a small offering to the boys. Whilst our in country leader showed us around the orphanage we greeted the boys (in our best Romanian) and gave them each some peaches / chocolates etc. Later we went into the art room (where the less severely disabled young men are encouraged to express themselves) and we were shown a variety of work that the men had produced, ranging from small embroideries, to bracelets to scarfs. Visitors are encouraged to support the orphanage by purchasing something from the room – to help raise funds for more art materials. I purchased a small embroider butterfly that I will cherish for years to come. Overall, I think that my experience has changed me on a personal level. I have always been aware that others are less fortunate than I, however before visiting Moldova, my awareness sort of acknowledged that fact but didn’t fully permeate into the way I lived my life. Now however, when I moan that I have a short deadline for an assignment or that I have to go to work at the Co-op as a part time job to help fund myself at university, I think to myself ‘but at least I have a job, I have prospects, I am on my way to gaining a career’; because the children and young adults I saw and worked with in Moldova don’t have that, they don’t even have their own belongings like I do. It has definitely taught me to be more grateful for what I do have, and to complain less about what I do not have. I would also like to personally thank the creators of the Eleanor Peel Fund, as without it I would have struggled to have this experience. Being a student, every penny counts, and I spent the majority of my allowance from the fund on the numerous vaccinations that I needed before travelling abroad. I hope that others will continue to benefit from the fund as I have in years to come. Once again, a BIG thank you. I am writing to thank you for the money you gave me towards my amazing trip to Cambodia and Thailand. I spent a month in Cambodia, three weeks of that I taught English in a small village two hours outside of the capital. 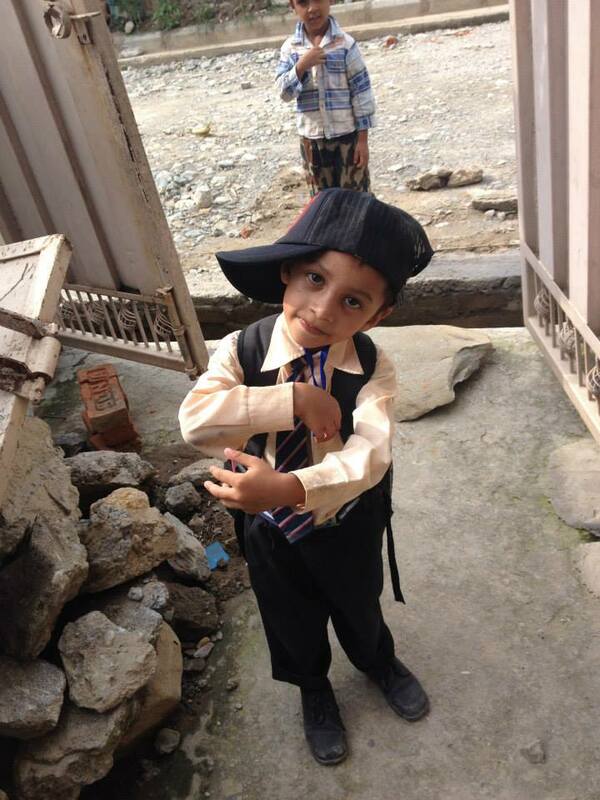 The children I taught were very underprivileged but were such happy children that worked really hard. The lifestyle the children led was very basic, with no clean/ running water, poor hygiene, minimal food and clothing; but they had amazing spirit. Family, friends and education took priority, which are often things taken advantage of in England. My role whilst I was over there was to teach English in Hope Agency school, I taught for four hours a day, children of a variety of ages in the very minimalistic classroom conditions, and I can honestly enjoyed every moment of it. I have learnt a lot during this experience not only about my personal attributes but also more about the profession I am going into regarding children with English as an Additional Language (EAL), how to teach in an inspiring manner with very little, the biggest resources being my personality. Living in the same conditions as the children enabled me to really understand how they live, although I wasn’t sleeping outside with the chickens like some of the children I taught were doing as they are the only income the family had, I didn’t have a bed as we know it, bucket showers and one meal a day, again the food wasn’t the same as you would expect in England, if someone asked me if I have eaten dog, I couldn’t answer because I honestly don’t know what I have eaten! 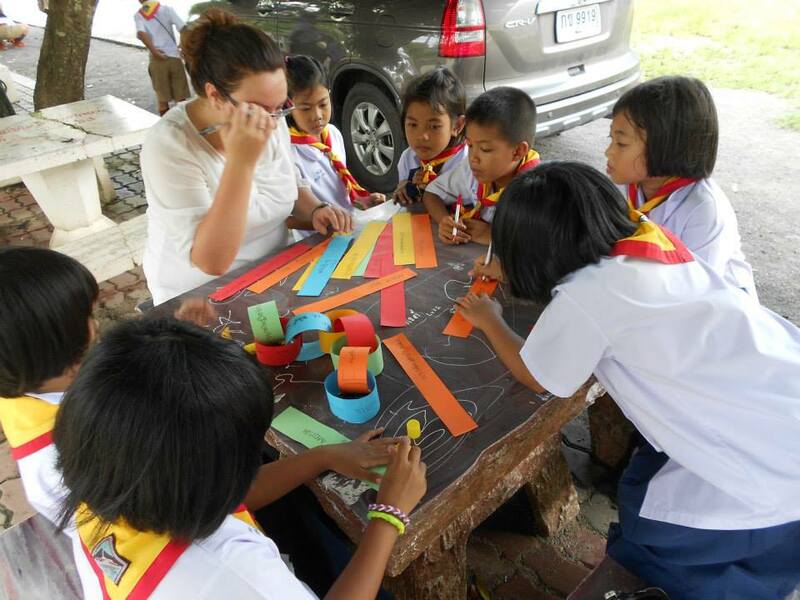 Teaching in Thailand was a totally different experience as the school I volunteered at had 520 children of which I taught each child once a week. The school was in an area which had been hit badly by the Tsunami in 2004, for many years the charity which I taught with took the topic of family off the curriculum because most of the children in the school had relatives which had died in the Tsunami. Now ten years later the community are still rebuilding itself, and learning English is seen to them as a kind of snobby, as the people who can speak English are the ones who can make money through tourism which is the way Thailand seems to be getting itself back on their feet. The school allowed me to understand Thai culture a lot and provided a more of a challenge in the classroom compared to Cambodia, although the living in Cambodia was more difficult. The children in the Thai school understood English a lot less and were unable to hold a conversation or respond appropriately unless the response has been repetitively drilled, “hello, how are you?” “I am fine thank you”. Classroom management and behaviour was also a lot harder because they weren’t able to understand and explanation of an activity so acting things out, pictures and singing songs were the way we got the children to understand what we wanted. 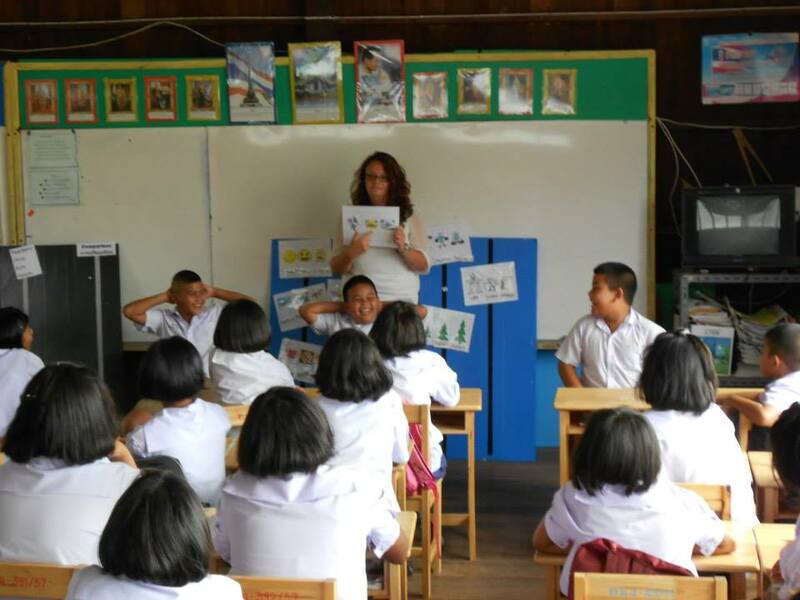 For basic classroom phrases such as “stand up please”, “sit down”, “thank you”, “quiet please” for example, I learnt a lot of the simple phrases in Thai, by the end of my time teaching I was able to translate some of the words I was teaching into Thai then English. I think that also made me realise what it is like for a child to come to England as a new arrival with no or little English and are expected to attend and English school, I think this is a feeling that will help my teaching career as I will understand how they feel and I will be able to help them rather than get frustrated that they can’t understand. I could tell you all so many stories but I have just realised I am now on my second page and I need to stop waffling. I just want to thank you all for helping make it happen, I have learnt so much about myself, teaching and how other people live. It has been a great and humbling experience that I will take with me and probably talk about for years, so thank you. I have always been one for an adventure; I thrive on discovering new places, new people and new cultures. 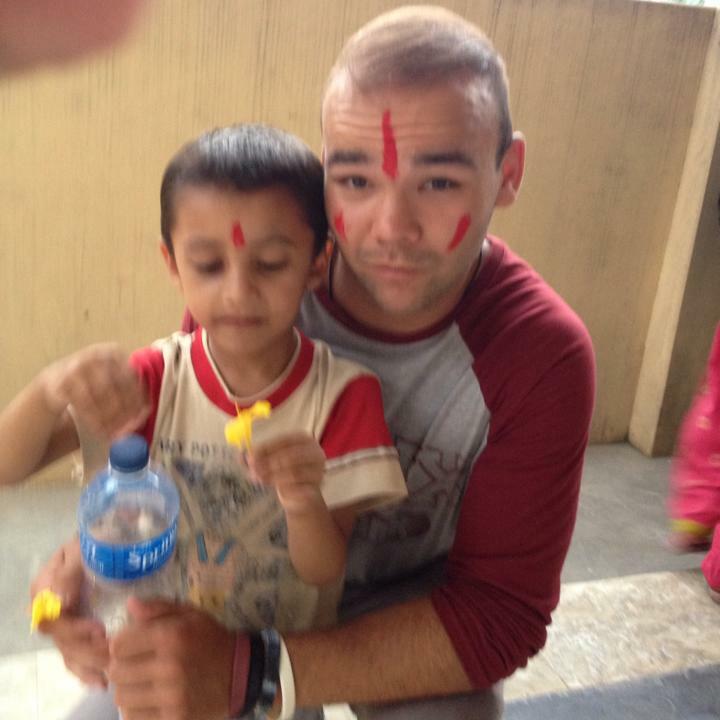 With what potentially could be my final free summer before I head into the world of work I decided to put myself out there and go on a volunteer trip to Nepal to work in an orphanage, whilst doing what I do best and exploring the amazing country during my free time. My reasons behind choosing Nepal in particular were that it’s a country that has always intrigued me, from its beautiful mountain ranges to the slums of the cities, there’s plenty to explore and a lot to learn from. Leading up to my trip I made an attempt to fundraise part of the fee for the programme itself, which turned out to be a lot more difficult than I anticipated. Without the help of the UCSU and the Eleanor Peel Trust my task would have been a whole lot more challenging. I had managed to organise a charity event at the university which provided me with a platform but with the extra funds provided from the Eleanor Peel Trust I was well on my way to achieving my target. The weeks leading up to the trip, which began on the 1st of June, seemed to fly over and before I knew it I only had a couple of days to pack all of my gear ready for my flight on the 29th of May. This was my first major overseas adventure which I would be undertaking alone, so as you can imagine, the nerves were slowly starting to creep in. Fortunately enough though, I knew what I was doing was the right thing, and I had the full backing of the people around me, despite a few worried concerns about me travelling solo. After a couple of days of travelling I arrived at Kathmandu Airport not knowing what was in store for me. 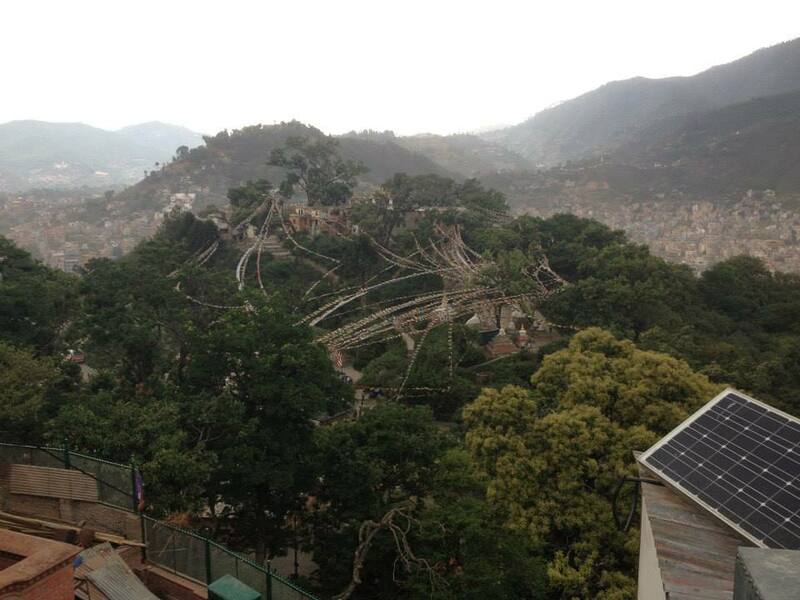 I had read up on Nepal prior to my departure, but nothing could have prepared me for my actual experiences. The first thing I noticed was the size of the airport; it was very small and very basic, on arrival I had expected to have been greeted by someone from the programme, but there was nobody in sight. At this point I began to worry; I was in an unknown country, not knowing what I was doing. After applying for my visa I stepped outside into the heat of Nepal, the sun immediately hit me and I began sweating more than I already had during the flight. After taking a split second to adjust to my new surroundings I hauled my backpack over my shoulder and header to the taxi ranch. I had read that you should never trust any taxi driver under any circumstance other than one you know. I finally spotted my name being held up on a piece of paper, the relief I felt was immense, I headed over to the two men calling my name, but at this point I was swarmed by a crowd of taxi drivers trying to take my bags and usher me into their cab. I was having none of it; I eventually shoved my way to the two men from the Hope and Home project (the project I was assigned to) and jumped into the back of their mini bus. To say I didn’t enjoy that experience would be wrong, it was like being treated as a celebrity where everyone wants a piece of you. I remained quiet for the 30 minutes it took to get from the airport to the guest house; my mind was very much focussed on what I was doing, where I was and how I was feeling. That particular journey was one of the more crazy ones I had experienced, there seemed to be no structure to the roads, it was like a disaster waiting to happen, yet somehow the many hundreds of people on the roads managed to narrowly avoid each other. Upon arrival at the Kathmandu Peace Guest House I signed in and made my way to the bedroom at the very top of the building. I was one of the first to arrive so there was nobody around to meet at this time. After settling in, the only thing I wanted to do was go out, meet people and see the city. Unfortunately however the lock on my door broke and I therefore spent the night sequestered in the bedroom. My current feeling at this point were very mixed, whilst I was still thrilled to finally be there, I couldn’t help but feel restricted and confined. I began to question what I was doing and if it was the right thing. A few hours later my roommate, Robie, was brought up to the room. The man from the check in desk was able to fix the door to let him enter. After an hour or two of getting to know each other we had already become good friends, this set me up well for the next day when the three day orientation began. Waking up at 6 30 the next morning came a slight shock, for those that know me you’d understand that anything before noon is too early. Myself and Robie headed down for breakfast in the guest house restaurant, there was one or two people other people already there sat quietly eating away. Over the course of the next few hours more people arrived and we all began getting to know eachother, there was a good mix of people, some had come with a friend, others by themselves. The striking thing got me however, was the varied nationalities, there were people from France, America, Asia, Australia and even a girl from Latvia. After enquiring around, I found that I was the only English person there, which pleased me greatly. The first day of orientation was essentially ice breakers, ensuring people got to know each other, whilst also attempting, and in my case failing, to learn Nepali. As the day quickly passed we were taken out for an evening meal in the centre of Kathmandu, this was finally my chance to see a bit of the culture that this city is famous for. The evening went well, I got to see one of the Stupas (temple) in the city and had a pleasant meal at a Nepali restaurant. The final two days of orientation followed suit, there was much exploring throughout the day, including a visit to the infamous Swayambhunath or Monkey Temple as its translated to, followed by a meal out at different restaurants and even a night out at the local bars. The city itself was very peculiar, there were hundreds upon hundreds of people walking about whilst people were flying round in taxis and on motor bikes. Everywhere you looked you could see tourist shops and stalls and at every turn there would be someone desperately trying to sell you their latest item at was I supposed was a highly extorted price. The number of beggars was staggering also, as a tourist walking down the street you are not safe from their grasp, once they’ve spotted you, you have a split second to escape or become bombarded by gestures to hand over your money. The roads and buildings were in very poor condition, the roads were half dug up, and the buildings were on the verge of collapse. But obviously there was no money to invest in order to rebuild such things. On the final day of orientation it was up to us to decide which city we wanted to complete our projects in, the majority of people, including myself, chose Pokhara, this was mainly because it the place to be if you wanted numerous mountain views with the chance to trek a few of them. The 7 hour bus journey there was a mixture of torture and absolute delight. Whilst the coach was unbelievably hot and cramp with very little room to manoeuvre, the views from the windows were like ones I had never seen before. Mountain range after mountain range for 7 straight hours, it was impossible to become bored. When I eventually arrived at the Pokhara bus station I was greeted in a fashion that wasn’t too dissimilar to the whole airport experience. Whilst there were roughly 12-15 volunteers who had travelled to Pokhara we were all split into separate groups depending on where our placement was. My feelings upon arriving at the home stay were as they were upon arrival in Kathmandu; I wasn’t entirely sure what was going on. Having been placed in a house with Robie however ensured that I was around somebody I knew. The first day was spent settling into the house, meeting the family and the locals around the village, the living situation came as a mixed bag, whilst there was running water, it was always cold and the toilet, well.. It was a squat toilet. Over the two weeks I was in Pokhara I learned to appreciate the cold showers, as the temperatures were over double what they are in England I found myself dripping with sweat after any form of activity, therefore cold showers came as a god sent, and I even eventually became accustomed to the squat toilet. The host family I was staying with were fantastic, the father, who is the head of the programme in the area, was very supportive and spoke good English, the mother, who was always on hand to provide an overly large portion on the national dish, Dahl Baht. They had three girls who again, all spoke English, and they also lived with two of the grandparents, the grandfather in particular, I found to be one of the most interesting and humorous people I have ever met. The orphanage programme began the next day, it consisted of being at the orphanage for 7 45 every morning to get the children ready and then take them to school. I then had free time from 10am until 3 30pm which I usually spent by either heading into the town centre, which was about a 30 minute walk, or spending a few hours reading a book at the house. On occasion I would even spend the day in the school assisting the volunteer teachers with their lessons. After picking them up from school you then spend the evening doing their homework with them until around 6/7pm. There were 11 children in the orphanage, all of which could speak a good level of English, which made the experience a whole lot better for me. There was not one child I could fault, they were all sweet and kind hearted and enjoyed life the best that they could. Whilst I never spoke to them about how they became orphans you could see that some of them had been through hell. I even noticed some of the kids had burn marks on their arms, it’s tough to think about how that would have come about. When people ask whether or not the orphanage programme is beneficial or not, you only had to see the children’s faces each and every day. I’m not sure how they acted when I wasn’t around, but as soon as you enter the orphanage you become surrounded by smiling faces staring up at you. Whilst there wasn’t much to do with the kids, as the homework takes up most of the evening, the impact you have from just being there is enough to make their day. Just being around them seemed to make them happy; they really took delight from the smallest things. Having been through similar circumstances in my life, all be it in a more developed country, I was filled with delight as to how happy they were. You would think they would be down and upset a lot of the time, but the only time I ever saw that was on my final day doing the programme. It’s hard to express in words the bonds that were formed between the kids and myself, a feeling only I and other volunteers will fully understand. During the two weeks in Pokhara I was able to undertake a trek with some of the other volunteers on the first weekend, and then a safari the following weekend. The mountain trek was exactly what I wanted, whilst it only lasted 2 days I was finally able to see the mountains first hand, we spent the night in a hut near the summit of the mountain, it was a great experience and only a longer trek up the more famous and challenging mountains could have topped it. The safari was again another unforgettable experience; the main activities included a canoe ride along the river, an elephant safari walk followed by bathing with the elephants. It was good to be able to mix it up a little while I was there, obviously the whole point of the trip was to help the children in the orphanage but for me especially it was great to take time out to indulge myself in something I had long dreamed about. During my time off from the orphanage during the week, I would take the walk to the town centre even if it was just to see the lake. It was one of the most exquisite landscapes I had seen. Standing on the lake side you look around and all you see is mountain after mountain, and on the days when the weather was good, it provided me with on the best views from the whole trip. It was calming taking the time out to sit in the local bars with a refreshing drink and observe the lake, watching people out on the boats or paragliding from the top of the overlooking mountains. It provided me with the perfect opportunity for reflection on the whole experience, which I believe is a key part of any trip. On the evenings I would again head to the town but with a larger group of volunteers, we would then go to a restaurant for food to save ourselves from another helping of Dahl Baht. These occasions sometime lead to a few beers and a good night out. My personal opinion is that the whole atmosphere, especially when the World Cup began, was far greater than that I have experienced in England. The whole clash of the cultures was just fantastic to be a part of, learning the stories of people from all over the world, finding out what they’re doing in the country and what their future plans were. Towards the end of the trip I began to regret not being able to spend more time in the country, the book I was reading at the time involved two Englishmen who met each other whilst travelling, they ripped up their flight tickets and continued on their adventure. This only made me more desperate to stick around. 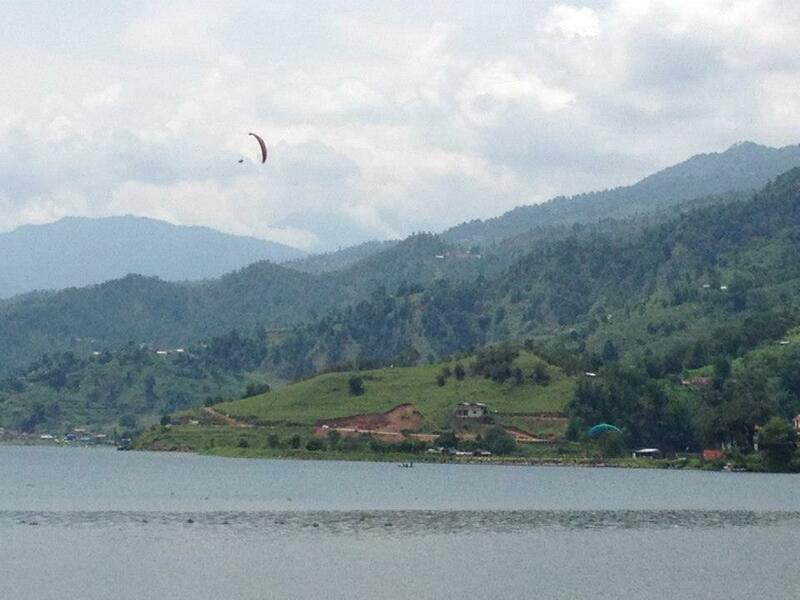 However all good things come to an end, and when my final day in Pokhara arrived I was desperate to stay. The children in the orphanage thought I was joking when I said I was leaving, but when they realised I was actually going, the reaction I got was inspiring. Kids I had only known for two weeks were hugging me, holding back the tears, if there was ever an indication as to how much of an impact volunteers make on these kinds of projects, this was it. I like to think of myself as mentally tough when it comes to emotions, but admittedly even I felt for the children. Spending every day with them, you become attached and saying goodbye proved to be quite hard. More so because of the whole situation, many of the orphanage volunteers over the years have been females, so for the young lads I believe having a male influence benefited them greatly. My only concern is that it only lasted for two and a half weeks. It’s easy to say if you did something again you might do things differently… I wouldn’t. The whole experience was one which I am unbelievably grateful to have experienced and I only wish the people who have supported me were able to feel everything that I have felt whilst there.